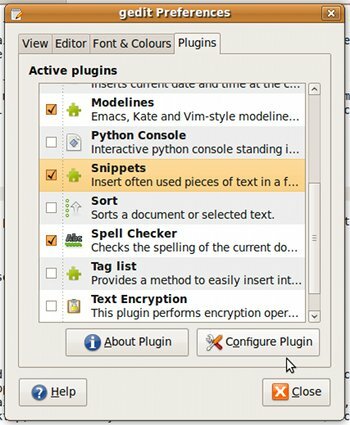 After the pluginf have been installed open Gedit and enable plugins. Mark the checkboxes for the plugins you want to enable. Ctrl+Alt+PageDown Switches to the next tab to the left. Ctrl+Alt+PageDown Switches to the next tab to the right. Alt+n Jump to nth tab. Ctrl+S Save the current document to disk. Ctrl+Shft+S Save the current document with a new filename. Ctrl+P Print the current document. Ctrl+W Close the current document. Ctrl+Shft+Z Redo the last undone action . Ctrl+X Cut the selected text or region and place it on the clipboard. Ctrl+C Copy the selected text or region onto the clipboard. Ctrl+V Paste the contents of the clipboard. Ctrl+U Change highlight to Upper Case. Ctrl+L Change highlight to Upper Case. F9 Show/hide the side pane. Ctrl+F9 Show/hide the bottom pane. Ctrl+G Find the next instance of the string. Ctrl+Shft+ Find the previous instance of the string. F7 Check spelling (with plugin). Alt+F12 Remove trailing spaces (with plugin). Ctrl+Shft+T Remove Indent (with plugin). F8 Run make in current directory (with plugin). Ctrl+Shft+D Directory listing (with plugin). F1 Load Gedit's online help document.